Review by #1 BondGirl, Patti. working with my professor on photographing artwork from the permanent collection as well as works from new exhibits,for brochures and promotional products. and it was always so exciting to see the majestic marble building and all the treasures it held. McKim, Mead and White. It is the heart of our city's lively, thriving, and creative world of artists and all the people of Youngstown who love art. It's a gathering place for visual and performing arts, music, parties, and weddings, and a lovely place to spend a leisurly afternoon. It was during this time as a student that I was given a class assignment. We were instructed to produce a slide show, topic of our own choosing, and present it to the class as our final project. I was leaving for a trip to New York City, to spend a few days with my sister and her group of fashion merchandising students from Indiana University. I packed a huge bag of my camera equipment (35mm! Yes, real slide film! Kodachrome!) and off I went with my plans for my "I Heart New York" slide show. While Regina was off with her students to visit showrooms and designer studios, I set off to explore the city through the lens of my camera, tripod hooked over my arm, and not even trying to pretend I was not the city-struck, neon-dazzled tourist that I surely appeared to be. Native New Yorkers indulged me kindly. I snapped seven rolls of film in three days. One of the loveliest places I visited was Washington Square. I walked down a narrow street into the open space of the park, and it literally took my breath away. The famous arch is a gateway to one of the most important green areas of the city, a space filled with activity from the nearby university and the people who live in the Village. I approached a group of men who were seated at the checker tables, and they smiled and allowed me to photograph them. I sat on one of the old wrought-iron benches and took it all in, on sensory overload, feeling the history and tradition and the modern bustle of city life all in one space. When I got home, photos developed and arranged on my light table, I started to sort through the images. I needed to research a bit to give information on all my pictures as I would narrate the slide show. In my research, I found out that the architect for the arch at Washington Square, Stanford White, was part of the firm McKim, Mead & White, who had designed The Butler. I remember feeling quite amazed at the connection I felt between my city and The City, and how excited I was to know both structures in my time as an art student. Now, over 20 years later, I connect again. This time, not with visual art, but with the art of perfumery. Bond No. 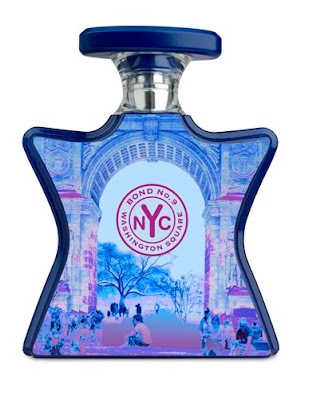 9 has created a fragrance for Washington Square. I'm flooded with memories of my visits there. The perfumer for Washington Square is the amazingly talented Laurent Le Guernec (who has created about a dozen Bond scents, as well as many others including my beloved MAC Air Of Style.) He's taken all the diversity of the location, and blended it into a bottle of fragrance that evokes sight, sound, and scent. Washington Square, the fragrance, is a beautiful, warm-hearted rose fragrance with a little honey for sweetness and a little leather for edge. These are the most prominent of the notes on my skin. Le Guernec has a particular knack for adding spice to floral, and his addition of tarragon gives the floral notes a quirky little twist, and vetiver in the base delights me because it is so unexpected in a women's scent. I love vetiver on my husband and now I can wear it, too. I'm learning that rose-based scents are my favorites and are as varied as the flower itself. The rose note in Washington Square is as velvety as the petals of the flower. The familiar star-shaped bottle looks like a watercolor painting of the arch in pretty, misty blues and soft purples, a hint of the purple rose note inside. It's been too long since I visited New York. I miss my friends, the excitement, the street vendors, the food, I miss it all. I hope to get there soon. But for now, I think it's time I headed over to The Butler to pay a visit to this old friend. I'm going to wear Washington Square for my visit. 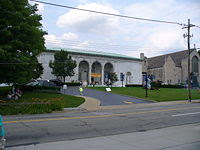 I will remember the connection between the art building and the arch, between Youngstown and New York, and between art and the art of fragrance. Disclosure: Press sample provided by the company. This was a lovely post and thank you so much for sharing a great memory! Great review! Can't wait to try it! Yours and the Blogdorf's Bond No. 9 reviews will be helping me choose my very FIRST Bond fragrance when I visit NYC in December (so excited!!) Thanks so much for your wonderful posts!! You and Blogdorf got me interested in Bond and I'm excited to check it all out! And I want that bottle! What a terrifically sentimental post. Thank you for sharing why this scent is special to you. Wow this is such a beautiful review, I really enjoyed reading it! More than anything, scents really do connect you to time and space. I ADORE BOND NO.9! The unique beauty in each fragrance brings back an undeniable memory from the past as well as create new ones. Laurice Rahme, her vision and creation...Genius. I'm a Bond No.9 fan forever. CBeauty..
Annie, where did you go? Things just aren't the same without you! Hope all is well!